Excitement and Growth – Haven’t heard that in a while? Many of us have been to a local Sound Off or loudest car event of some shape or form. Some people say, “meters never lie, loudest car wins, it just that simple.” Sound Offs are about competition, promoting our businesses, and rewarding the love and hard work that we put into our vehicles. A few years ago, I went to a local show, and it was great. Tons of cars, people with the same interests as me, bass so loud it makes me grin from ear to ear. Then the competition started. 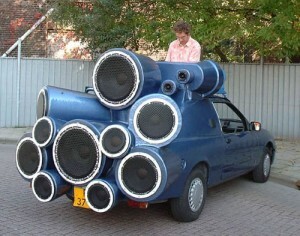 I saw a teenager pull up, cranked up his volume until it went to eleven, hit a 129.9 db! He was so excited that he was high-fiving his buddies, it was awesome. Then another competitor shows up with this vast surfboard amp, and hits a huge number…beating the previous competitor by over 10 db. They were in the same class because of the wattage rating of the amp or due to the rules about using one amplifier. The 129.9 db teenager, is now completely bummed out because he spends three months of his tips from his afterschool job delivering pizza, only to get destroyed in the competition. Is this fair? Did we lose a customer? Will he buy any more 12-volt electronics? I agree that there has to be a winner and a loser, but we are promoting our business and promoting our industry. Was the show a success? Two of the three governing bodies for Sound Offs in North America have adopted new classes to stop these situations from happening. I am going to water down the rules for the sake of this article. I encourage you to check it out on their Facebook pages and websites. This doesn’t seem to be too exciting, but Class 1 is limited to 1000 watts. How do they enforce this rule with untested or cheater amplifiers built for circumventing the rules and or the classes? This is the rule enforced by using a clamp meter integrated with the measuring device. In Class 1, you cannot exceed 1000 watts of total power. If the competitor does, he is disqualified. In Class 1, you can use a 2000, 3000 or 10,000-watt amplifier BUT it cannot be producing more than 1000 watts. This means any amplifier from any company is liable to be used, even the less used Japanese style of amps on the market. With wattage being limited, it comes down to box and vehicle. Creativity and sound design take center stage instead of equipment. I believe this is amazing and the “reset” the Sound Off scene needs. I applaud this move by the governing bodies of DB Drag Racing and USACi for taking this bold step. IASCA is the third governing body for Sound Offs in North America; they too have classes limiting wattage. They have chosen to use fuses to limit the current in their classes. What are the positives of this format? Low cost to competitors and no additional equipment needed for retailers or show promoter when holding events. Bravo boys, bravo. All three governing bodies have recognized the need for limiting wattage/current in some shape or form. It seems all three governing bodies are on the same page and are sharing common goals – to include and grow the current competitor base of our clients. If you haven’t held or been to a local Sound Off in your area, maybe its time to check one out.